Joan of Arc (Jeanne d’Arc), the national heroine of France, was born at Domrémy village on January 6, 1412, to Jacques Darc and Isabelle. Joan exhibited a pious character and was often absorbed in her prayers. At 13 years old, she started hearing inner voices calling upon her to drive the English out of France. A civil war was going on in France and the English were supporting the Burgundians. The assassination of Louis of Orléans by the agents of Burgundy had escalated the conflict. Domrémy was with the Orléanist (or Armagnacs), the party of Charles of Ponthieu (later known as King Charles VII, r. 1422–61). Joan supposedly received heavenly commands from St. Margaret, St. Catherine, and the Archangel Michael to rescue Orléans. The English ruler Henry VII (r. 1422–61), claimant to the French throne, occupied Paris in 1418. The major cities of northern France ceased to be under Charles VII’s control. The situation was becoming critical after the English lay siege to Orléans, the last Armagnac stronghold, on October 12. Joan, with her mandate from God, saved the situation for the French king. Dressed in male attire, she rode for 11 days with her escorts to meet Charles. Joan called herself as La Pucelle (the Maiden or Virgin) as she had promised the saints to keep her virginity. She believed that Charles was the true heir to the French throne. An ecclesiastical commission headed by the archbishop of Rheims, Reginald of Chartres, supported her cause after thorough interrogation. Joan had shown remarkable calmness before the theologians and her reputation as another saint was spreading. Charles was convinced of her simplicity, honesty, and intuition. 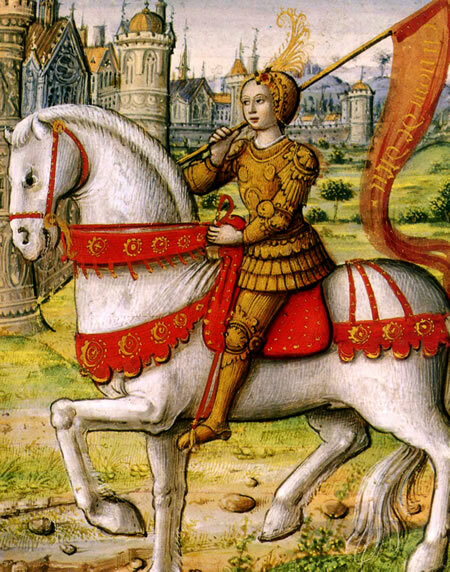 Joan dressed as a knight, commanding a large force against the English and Burgundians. With her piety and simplicity, Joan restored the confidence of the French. She advised the English to leave France per the desire of the son of Saint Mary. 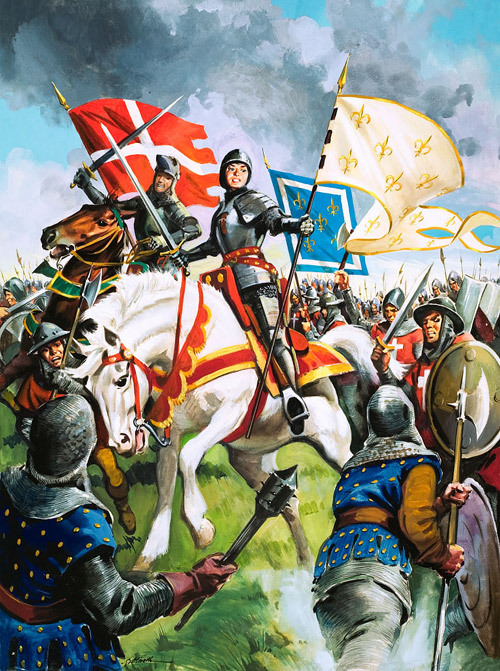 Joan entered into Orléans in May 1429 and defeated the English. Some of the English soldiers deserted, thinking that they were being opposed by the supernatural prowess of Joan. She portrayed the Orléanists as patriots, the Burgundians as traitors, and the English as the enemy of France. In June the towns of Jargeau and Beaugency fell. Joan defeated the troop led by Sir John Fastolf of Meung in the battle of Patay. The archbishop of Embrun declared in June that she was divinely inspired and requested Charles to seek her advice pertaining to war. Joan urged Charles to declare himself as the legitimate ruler of France. Reginald of Chartres performed the coronation ceremony on July 17, 1429, at Rheims, place of traditional crowning of the French kings. She began her second mission as inner voices urged her to take back Paris from Burgundians. Charles and his adviser the archbishop did not support her. The king was more interested in a political rapprochement with the Burgundians. Joan and the duke of Alençon, along with new recruits, marched toward Paris on August 23. The vacillating policy of the king and advisers had given enough time for the English and Burgundians to regroup. Meanwhile Joan was trying to persuade the inhabitants of many towns to rally behind the king. The stories of her miracles came in March and April 1430 amid war. At Lagny-sur-Marne, she and the virgins of the town revived the dead body of a baby temporarily to be baptized. On Easter Day of April 22 she had visions from the saints that the enemy would capture her before Saint John’s Day, on June 24. She also had the premonition of her inevitable demise on the day of her capture on May 23 at Compiègne. She was imprisoned and sold to the English for a sum of 10,000 livres by the Burgundians. A sham trial began at the headquarters of the English at Rouen. Pierre Cauchon was in charge of the trial, and the bishop of Beauvais was the presiding officer. The former had the reputation of bribing officials, and the latter had lost his bishopric because of Joan. Anybody speaking in favor of the defendant was imprisoned. The trial by inquisitorial tribunal increased the reputation of Joan because of her brilliant answers to the accusation that her voices were inspired by the devil. She was pronounced a relapsed heretic and burned at the stake on May 30, 1431. In her last breath Joan forgave the accusers and uttered the name of Jesus. Jean Tressard, secretary to the king of England, commented that they had burned a holy person. The executioner, Geoffroy Theragew, was apprehensive that he was damned because he had burned a saint. The unification of France came after her death. Charles restored her name and declared the trial illegal. Even dispensing with the supernatural factors associated with her, the fact remains that she became a living symbol of French nationalism. Her role was a major contributing factor for separating the English from Burgundians, reviving confidence among the French, and driving out the English from France. The papacy declared in 1456 that Joan was wrongly convicted. It pronounced her as martyr and the trial judges as heretics. She was beatified on April 11, 1909, and canonized as a saint 11 years afterward on May 16. The feast day of St. Joan falls on the second Sunday in May. The spirit of St. Joan lived on. During World War I, the Allied soldiers paid tribute to her. Both the Vichy regime and the French resistance used her symbol in World War II.